I made it out to Big Bend National Park this past weekend and was pretty blown away by the sunsets at The Window. After an entire day of rainy skies, the sky opened up and gave us this amazing sunset. 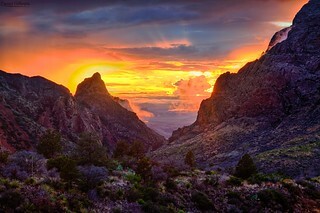 Even the park rangers raved to us how amazing this sunset was for even Big Bend standards. It was pretty spectacular how the bright oranges and yellows hung around until 10pm. I can't wait to get back. This is a 3 exposure HDR edited with NIK.